Sunday, June 10, 2018, 2:30 p.m.
Friday, June 15, 2018, 7:30 p.m.
Saturday, June 16, 2018, 7:30 p.m.
Sunday, June 17, 2018, 2:30 p.m.
“Hey, Stelllaaaaaa!” It’s 1947 in New Orleans, and Blanche Dubois is a fragile English teacher on a desperate prowl for a place in the world to call her own. After being exiled from her Mississippi hometown, Blanche suddenly appears on the doorstep of her sister Stella and her short-tempered brother-in-law, Stanley. As Blanche invents an artificial world to cover up the reality of her situation, she only enrages the animal inside Stanley. And as rumors of Blanche’s past catch up with her, circumstances spiral out of control until they reach the play’s dizzying, devastating conclusion. 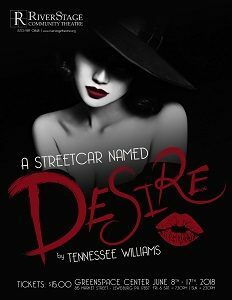 Hailed as “poingnant,” “luminous,” and “magnificent storytelling,” A Streetcar Named Desire is one of the “most imaginative and perceptive” plays in the history of 20th-Century American theatre. Reserve your tickets now — you don’t want to miss this chance to finally see this masterpiece live on stage, right here in Lewisburg!